Cadbury Oreo which has been recently launched by Kraft in India is trying every possible tricks to make a dent in Indian cookies market . Even as Oreo need no introduction to upper middle class who have been buying Oreo from imported food stores in metros ,it has to break the strangle hold of players like Parle , Britannia and ITC . A novel marketing ideas has been tried out by Cadburys to get into consumers attention by reaching out to family by allowing them to have freaking time together in a bus laden with Oreo cookies . It has also launched social media marketing thru Facebook fan page allowing people to be Oreo ambassadors . Cadbury India, which recently launched the iconic biscuit brand Oreo in India, flagged-off its Oreo Togetherness initiative. Symbolizing moments of family togetherness, the Oreo Togetherness bus will travel across the country as part of a movement that will provide parents with a platform to bond and will encourage them to spend more time with their family. 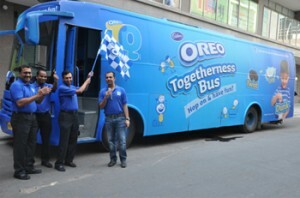 The Oreo Togetherness bus will travel across nine cities – New Delhi, Mumbai, Bangalore, Ahmedabad, Pune, Lucknow, Hyderabad, Kolkata and Mysore.